The F Series are are used primarily in the food, pharmaceutics, cosmetics and chemical industries. These pumps with CIP (Cleaning In Place) and SIP (Sterilisation In Place) capabilities meet the highest requirements for gentle handling, hygiene, cleaning and sterilization. These pumps comply with the highest of International Sanitary Standards and. 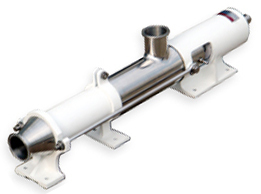 The Pumps are offered in all wetted parts being in Stainless steel with Food grade Rubber Stators. Conveyor Type Couping Rod Used to augment flow for viscous media. Stators are made of non-contaminating food grade polymers, resistant to oils, fats etc. Simple construction allows quick dismantling along with easy mounting joints ensures service friendliness. CIP (Cleaning in place) design allows for residual-free and bacteria-free cleaning. Can work against high vacuum. Ideal for lifting viscous fluids from the vacuum pan. Low fluid velocities ensures gentle handling of shear sensitive fluids without damage. FAS range is equipped with an open aseptic joint design that can be cleaned without residual particles through CIP continuous cleaning. The open fork joint features an especially shaped coupling rod without any contours, other than that it only contains a Pin and a Retainer spring. FAP range uses a standard pin- bush joint, these are generally used for more abrasive and viscous media to reduce the wear of the joint. 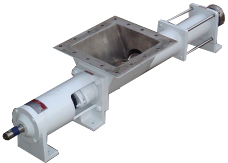 Pumps are available in Bareshaft and Close-coupled Designs. The WF Series are are used primarily in the food, pharmaceutics, cosmetics and chemical industries. These pumps with CIP (Cleaning In Place) and SIP (Sterilisation In Place) capabilities meet the highest requirements for gentle handling, hygiene, cleaning and sterilization. 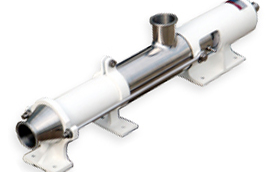 They have a Hopper type Suction Inlet allowing gravity flow of Plastic Viscous media on a screw conveyor “Augur” which pushes the viscous media into the pumping cavity. Bridge Breaker Paddle Assembly Used for products forming bridge while handling high consistency media. Counter Hopper Is used on top of the existing hopper to increase the holding capacity of the hopper. WFS range is equipped with an open fork aseptic joint design that can be cleaned without residual particles through CIP continuous cleaning. Hopper type suction inlet allowing gravity flow of Plastic Viscous media on a screw conveyor “Augur” which pushes the viscous media into the pumping cavity. FAP range uses a standard pin- bush joint, these are generally used for more abrasive and viscous media to reduce the wear of the joint.